Polymers are high molecular mass macromolecules, which consist of repeating structural units derived from monomers. Polymers have a high molecular mass (103 − 107 u). In a polymer, various monomer units are joined by strong covalent bonds. These polymers can be natural as well as synthetic. Polythene, rubber, and nylon 6, 6 are examples of polymers. How are polymers classified on the basis of structure? For e.g., high density polythene (HDP), polyvinyl chloride, etc. For e.g., low density polythene (LDP), amylopectin, etc. These polymers have many cross-linking bonds that give rise to a network-like structure. These polymers contain bi-functional and tri-functional monomers and strong covalent bonds between various linear polymer chains. Examples of such polymers include bakelite and melmac. Classify the following as addition and condensation polymers: Terylene, Bakelite, Polyvinyl chloride, Polythene. Explain the difference between Buna-N and Buna-S.
Buna − N is a copolymer of 1, 3−butadiene and acrylonitrile. Buna − S is a copolymer of 1, 3−butadiene and styrene. Arrange the following polymers in increasing order of their intermolecular forces. (i) Nylon 6, 6, Buna-S, Polythene. (ii) Nylon 6, Neoprene, Polyvinyl chloride. Explain the terms polymer and monomer. Polymers are high molecular mass macromolecules composed of repeating structural units derived from monomers. Polymers have a high molecular mass (103 − 107 u). In a polymer, various monomer units are joined by strong covalent bonds. Polymers can be natural as well as synthetic. Polythene, rubber, and nylon 6, 6 are examples of polymers. Monomers are simple, reactive molecules that combine with each other in large numbers through covalent bonds to give rise to polymers. For example, ethene, propene, styrene, vinyl chloride. What are natural and synthetic polymers? Give two examples of each type. Natural polymers are polymers that are found in nature. They are formed by plants and animals. Examples include protein, cellulose, starch, etc. Synthetic polymers are polymers made by human beings. Examples include plastic (polythene), synthetic fibres (nylon 6, 6), synthetic rubbers (Buna − S). Distinguish between the terms homopolymer and copolymer and give an example of each. The polymers that are formed by the polymerization of a single monomer are known as homopolymers. In other words, the repeating units of homopolymers are derived only from one monomer. For example, polythene is a homopolymer of ethene. The polymers whose repeating units are derived from two types of monomers are known as copolymers. For example, Buna−S is a copolymer of 1, 3-butadiene and styrene. How do you explain the functionality of a monomer? The functionality of a monomer is the number of binding sites that is/are present in that monomer. For example, the functionality of monomers such as ethene and propene is one and that of 1, 3-butadiene and adipic acid is two. Polymerization is the process of forming high molecular mass (103 − 107 u) macromolecules, which consist of repeating structural units derived from monomers. In a polymer, various monomer units are joined by strong covalent bonds. Is , a homopolymer or copolymer? is a homopolymer because it is obtained from a single monomer unit, NH2−CHR−COOH. In which classes, the polymers are classified on the basis of molecular forces? How can you differentiate between addition and condensation polymerisation? Addition polymerization is the process of repeated addition of monomers, possessing double or triple bonds to form polymers. For example, polythene is formed by addition polymerization of ethene. Condensation polymerization is the process of formation of polymers by repeated condensation reactions between two different bi-functional or tri-functional monomers. A small molecule such as water or hydrochloric acid is eliminated in each condensation. 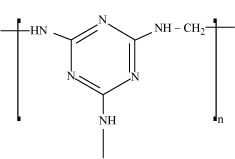 For example, nylon 6, 6 is formed by condensation polymerization of hexamethylenediamine and adipic acid. Explain the term copolymerisation and give two examples. Nylon 6, 6 is also a copolymer formed by hexamethylenediamine and adipic acid. Write the free radical mechanism for the polymerisation of ethene. Polymerization of ethene to polythene consists of heating or exposing to light a mixture of ethene with a small amount of benzoyl peroxide as the initiator. Define thermoplastics and thermosetting polymers with two examples of each. Thermoplastic polymers are linear (slightly branched) long chain polymers, which can be repeatedly softened and hardened on heating. Hence, they can be modified again and again. Examples include polythene, polystyrene. Thermosetting polymers are cross-linked or heavily branched polymers which get hardened during the molding process. These plastics cannot be softened again on heating. Examples of thermosetting plastics include bakelite, urea-formaldehyde resins. Write the monomers used for getting the following polymers. One common initiator used in free radical addition polymerization is benzoyl peroxide. Its structure is given below. Natural rubber is a linear cis-polyisoprene in which the double bonds are present between C2 and C3 of the isoprene units. Because of this cis-configuration, intermolecular interactions between the various strands of isoprene are quite weak. As a result, various strands in natural rubber are arranged randomly. Hence, it shows elasticity. Discuss the main purpose of vulcanisation of rubber. 1. Natural rubber is quite soft and sticky at room temperature. At elevated temperatures (> 335 K), it becomes even softer. At low temperatures (< 283 K), it becomes brittle. Thus, to maintain its elasticity, natural rubber is generally used in the temperature range of 283 K-335 K.
2. It has the capacity to absorb large amounts of water. 3. It has low tensile strength and low resistance to abrasion. 4. It is soluble in non-polar solvents. 5. It is easily attacked by oxidizing agents. Vulcanization of natural rubber is done to improve upon all these properties. In this process, a mixture of raw rubber with sulphur and appropriate additive is heated at a temperature range between 373 K and 415 K.
What are the monomeric repeating units of Nylon-6 and Nylon-6, 6? The monomeric repeating unit of nylon 6 is , which is derived from Caprolactam. The monomeric repeating unit of nylon 6, 6 is , which is derived from hexamethylene diamine and adipic acid. Identify the monomer in the following polymeric structures. 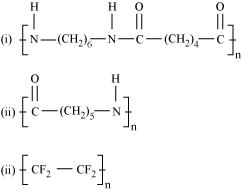 (i) The monomers of the given polymeric structure are decanoic acid and hexamethylene diamine . How is dacron obtained from ethylene glycol and terephthalic acid? The condensation polymerisation of ethylene glycol and terephthalic acid leads to the formation of dacron. What is a biodegradable polymer? Give an example of a biodegradable aliphatic polyester. A polymer that can be decomposed by bacteria is called a biodegradable polymer. Poly-β-hydroxybutyrate-CO-β- hydroxyvalerate (PHBV) is a biodegradable aliphatic polyester.